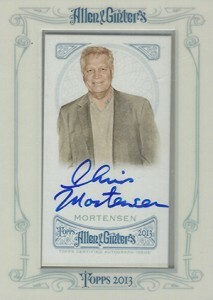 Every year, Topps Allen & Ginter Baseball delivers one of the most diverse autograph checklists in the hobby. We're not talking equal representation across all teams or several eras worth of home run champs. Rather, it's the "champions" from areas outside of baseball that create some of the most intrigue. 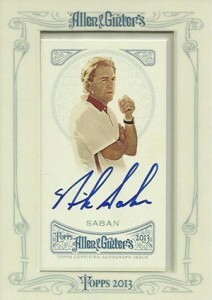 2013 Topps Allen & Ginter Baseball is no different. The set has 46 non-baseball autographs that cover the spectrum of mainstream superstardom all the way down to personalities not many people have heard of outside of Facebook shares and short blurbs at the back of the newspaper. That's not a knock against them or their accomplishments. Rather it's just part of the world they live in. 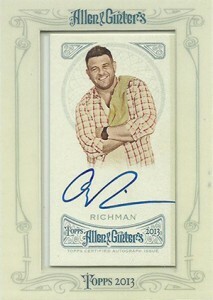 Here's a look at each of the 2013 Topps Allen & Ginter non-baseball autographs. Click on their names to shop for the cards you're looking for on eBay. Abe Vigoda may not be Hollywood's biggest star but he is one of its most recognizable faces. Vigoda perfected the art of the character actor. He's probably best known for playing Tessio on The Godfather and Detective Phil Fish on Barney Miller. In more recent years, he made semi-regular appearances on The Conan O'Brien Show. Raise your hand if you've watched Adam Richman take on some monster eating challenges on Man vs. Food and proceeded to the fridge at the next commercial break. The TV host is the envy of millions. He gets paid to travel and eat food. Pushing herself to the limits, Amelia Boone was the female 2012 Tough Mudder champion. It's a grueling 24-hour competition that tests athleticism, endurance, toughness and more. Boone also won the 2012 Winter Death Race. 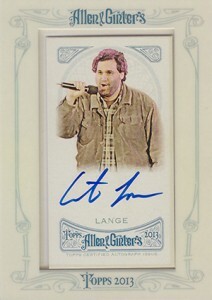 Artie Lange is one of the best-known comics to work largely outside the Hollywood system. Although he's appeared in numerous TV shows and movies over the years, it's his stand-up comedy and writing that has garnered the most attention. Definitely not the cleanest of comics, you might want to think twice before taking your grandma to his show. Axl Rose is someone who needs no introduction. The lead singer for Guns N' Roses, he's the voice behind such legendary tracks as Welcome to the Jungle and Sweet Child o' Mine. The drama behind the band has made Rose notorious in recent years. But that only adds to his rock star appeal. 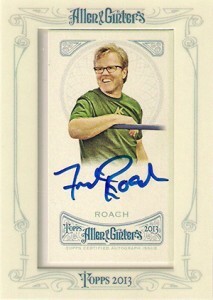 Rose also has autographs in 2013 Topps Archives Baseball. 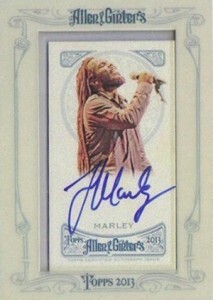 Topps did confirm that, like Archives, the Axl Rose Allen & Ginter autograph is a redemption. 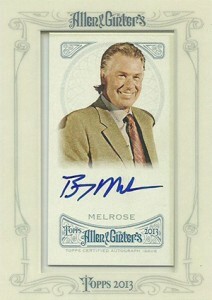 Barry Melrose rose to prominence as an NHL coach, taking the Los Angeles Kings to the Stanley Cup Finals in 1993. After two more seasons with the Kings, Melrose and his stylish hair shifted to broadcasting where he has been ever since save for a 16-game stint with the Tampa Bay Lightning in 2008. 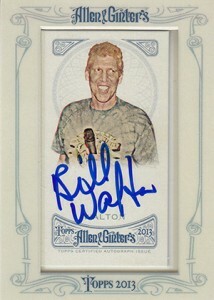 Bill Walton is one of the best college basketball players of all-time. He won the College Player of the Year Award three times and lead UCLA to consecutive NCAA Championships in 1972 and 1973. Although his professional career was cut short due to injuries, he still won a pair of NBA Championships and was named the league's MVP in 1978. Walton had a successful broadcasting career as well. He was elected to the Basketball Hall of Fame in 1993. Coaching the Florida State Seminoles from 1976 to 1999, Bobby Bowden is college football's most decorated coach. He retired with 377 NCAA wins and 21 Bowl victories, both records. He also led the Seminoles to national titles in 1993 and 1999. 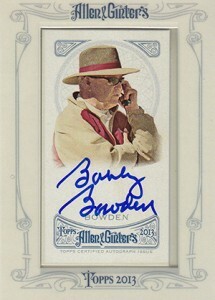 Besides Florida State, Bowden also coached at Howard and West Virginia. One of the most accomplished female sports journalists working in the industry today, Bonnie Berstein has spent significant amounts of time with both ESPN and CBS. She is also involved in other areas of the media and has been an advocate for healthy living laws. 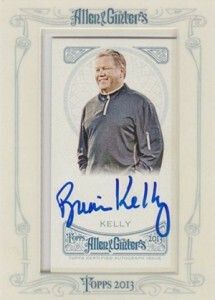 The Notre Dame Fighting Irish football program has once again risen to prominence under the guidance of Brian Kelly. After a perfect 12-0 regular season record, he led the team to the 2013 BCS Championship Game. Although they lost, Kelly was still named Coach of the Year. Since the award's inception in 1994, Kelly is the only two-time winner. He also won in 2009 while at the University of Cincinnati. In his stint as MLB Commissioner, Bud Selig has seen a lot of highs and lows. He's gained his share of criticism and controversy, including the 1994 strike and the steroids scandals. Then there's the tie game at the 2002 All-Star Game. On the flip side, Selig is also credited as helping baseball grow in many areas. Franchise values and massive cable deals are evidence of this. The current plan has Selig stepping down in 2014. Selig is also the owner of the Milwaukee Brewers. He bought the Seattle Pilots in 1970 and relocated the team in Wisconsin. When it comes to sumo wrestlers, Byamba is a rock star. Besides being a three-time world champion, he has been featured in numerous TV shows and movies including Ocean's Thirteen. There's a major level of prestige that comes with being a Victoria's Secret Angel. Besides being one of the company's leading ladies, Chanel Iman has appeared in countless magazines and ads. Her appeal reaches beyond North America. Iman's cover portfolio includes international editions of Vogue, Elle, Vanity Fair and more. Chris Mortensen came to ESPN in 1991 as an award-winning journalist. He even has a pair of Pulitzer nominations. Today, Mortensen is one of ESPN's most notable personalities, appearing on SportsCenter, ESPN Sunday Morning and Monday NFL Countdown. He is the network's Senior NFL Analyst. Chrissy Teigen made her Sports Illustrated Swimsuit Issue debut in 2010 and hasn't turned back. The model is capable of more than just landing a good shot, having made multiple guest hosting appearances on TV as well as substituting on Deal or No Deal. Five people might know Ed O'Neill from Dutch. Everyone else knows him as Al Bundy off the classic sitcom Married with Children. O'Neill can currently be seen on Modern Modern Family where he plays Jay Pritchett (aka the lucky old guy who's married to Sofia Vergar's character). 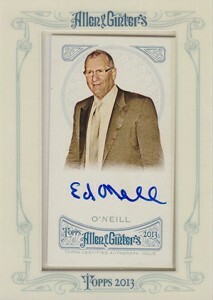 O'Neill has previously signed for Upper Deck's Spectrum of Stars line and Donruss Americana. Over the past few years, the popularity of paddle boarding has exploded. 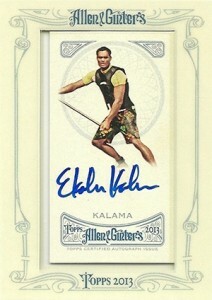 Ekolu Kalama won the 2009 World Cup of Stand-Up Paddle Racing. He is also a pioneer for the sport as he is seen as one of the first paddle boarders to get sponsorships. He's now the owner of his own team and has also added professional musician to his list of accomplishments. His boxers might get all the glory, but they owe a lot to Freddie Roach. Voter Boxing Trainer of the Year five times in the last decade, Roach has worked with the likes of Manny Pacquiao and Oscar De La Hoya. He has also trained several MMA fighter, including Georges St-Pierre. 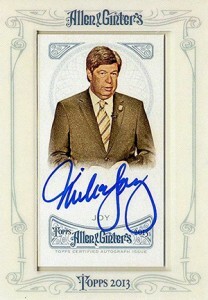 Planning on attempting to crack the 2013 Ginter Code? Good luck because you're going to need it. Along with his code-cracking parter, Frank Lattuca, Guillaume Robert-Demolaize has figured out the last two Ginter Codes. They also work with Ryan McCabe to win the 2011 championship. 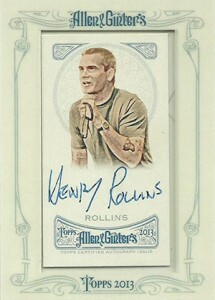 Although Henry Rollins is often credited as a singer. He's so much more. While he rose to fame as the lead singer for punk band Black Flag, he's maintained his outspoken demeanor in all of his projects since. Music, acting, writing, speaking -- Rollins does it all. And still maintains his street cred and aura of rebel cool. Jason Dufner came out of nowhere to send the 2011 PGA Championship to a playoff. Although he came up short against Keegan Bradley, he has notched a pair of PGA tournament wins since. He also tied for fourth at both the 2012 and 2013 U.S. Opens. 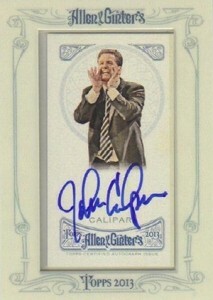 John Calipari is one of the top coaches in college basketball. A two-time winner of the Naismith College Coach of the Year award, Calipari led the University of Kentucky to the 2012 NCAA Championship. Beside Kentucky, he has also coached at the University of Massachusetts and the University of Memphis. He also spent a couple of years with the New Jersey Nets. Julia Mancuso holds three Olmpic medals including a gold at the 2006 Winter Games for giant slalom. The alpine skiier has also won five World Championship medals. In what is likely one of the stranger back stories for an American Olympian, Mancuso's father was convicted of for his role in a drug operation worth more than $100 million. The story does come with a happier ending. 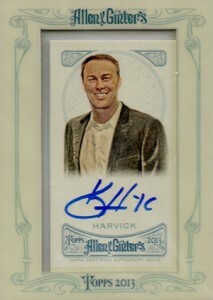 The 2001 Winston Cup Series Rookie of the Year, Kevin Harvick has driven his share of NASCAR victory laps. Still driving, Harvick has won more than 20 Sprint Cup Series races. Between 2001 and 2012, he finished among the overall season points leaders eight times. The beautiful Lindsey Vonn is one of the most recognized skiers in the history of the sport. She is one of two ladies to win four overall World Cup titles. 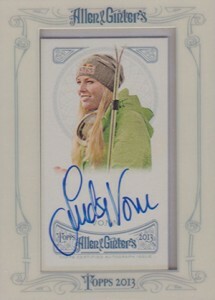 She also won a gold medal in downhill skiing at the 2010 Winter Olympics in Vancouver. Vonn frequently finds herself in the headlines now because of her personal life as she is currently dating Tiger Woods. A lot of professional sports owners sit silently in the background, at least when it comes to the public. And then there's Mark Cuban. The often outspoken Dallas Mavericks owner doesn't shy away from speaking his mind with the media. In fact, it's become a trademark for the successful entrepreneur. Further adding to Cuban's public profile is his role on TV's Shark Tank where would-be entrepreneurs vie for real-life investments from Cuban and the show's other "sharks." Few celebrities exist in the world of fantasy sports. ESPN's Matthew Berry is as close as it gets. 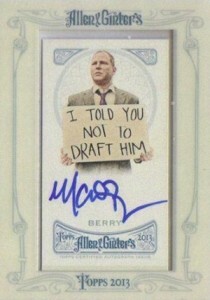 Berry traded in a Hollywood writing career for fantasy sports. "Mr. Roto" started as an online writer but quickly became a bigger guru. Here he is on ESPN Mint Condition discussing his inclusion in the set. 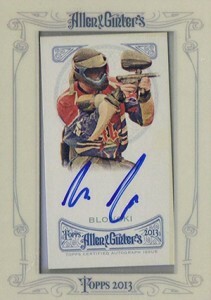 Matt Blonski started his pro paintball career at just 16. Alongside his brother Bart, the siblings were members of the Moscow-based Russian Legion. McKayla Maroney brought home a pair of medals from the 2012 Summer Olympics in London. She won gold as a member of the US Women's Gymnastics team. She also took an individual silver on the vault. But it's her "unimpressed" smirk on the Olympic podium that made her an even bigger sensation. Maroney has embraced it, recreating the expression in several places including the White House while she posed with Barack Obama. Mike Joy has been one of the main race callers on TV for more than 20 years. He has worked with FOX, doing their NASCAR broadcasts since 2001. Joy is no stranger to collecting, although his specialty is cars. He brings this expertise to auction coverage on Speed. 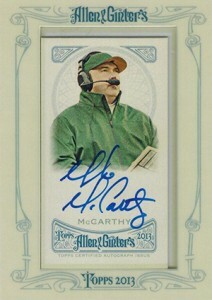 Mike McCarthy has been the coach of the Green Bay Packers since 2006. Within five years, he had led the team to another Super Bowl. Prior to being the man in Green Bay, he worked his way up the ranks as an assistant with stints in Kansas City, San Francisco and New Orleans. He was also a quarterback coach with the Packers in 1999. 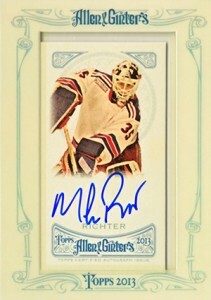 For New York Rangers fans, Mike Richter is a legend. He backstopped the team to the 1994 Stanley Cup. When Richter retired in 2002-03, he was the Rangers career leader in career wins and career games played. Despite his stellar career, Richter has relatively few autograph cards. If the Game Show Network were to make a Mt. Rushmore of legendary hosts, Monty Hall would get serious consideration. As the face of Let's Make a Deal, he made temptation an art form. When the 2012 Miss USA pageant went off the air, Nana Meriwether was the overlooked runner up. But when winner Olivia Culpo took the Miss Universe crown, she had to give up the national title. In doing so, at age 27, Meriwether became the oldest person to be named Miss USA. She is also a two-time All-American in volleyball. Nick Saban is one of the most decorated college football coaches of all-time. He's won four National Championships. His first came in 2002 with LSU. After a brief stint with the Miami Dolphins, Saban went back to school at Alabama. He has led the Crimson Tide to three national titles in three years (2009, 2011, 2012). A lot of people get a little nervous visiting Niagara Falls. Nik Wallenda walked across it on a high wire. And how does one top that? By crossing a gorge next to the Grand Canyon. 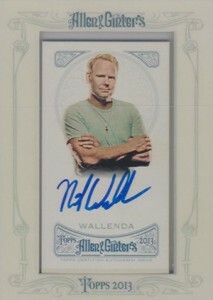 Wallenda holds numerous world records for his scary feats. Olivia Culpo is the reigning Miss Universe, winning the prestigious crown last December. She earned the chance to represent America by winning the Miss USA title that same year. She is the first American Miss Universe since 1997. 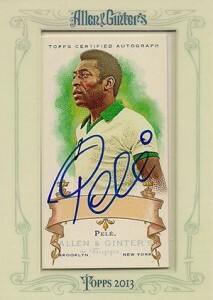 Pele is someone who really needs no introduction. He's the Babe Ruth of soccer. Pele's fame and influence reach far beyond the futbol field. Considered by many to be the greatest to ever play the sport, Pele helped lead Brazil to three World Cups. 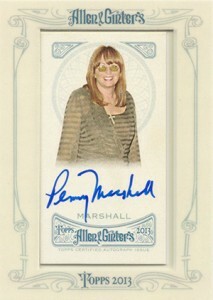 To most, Penny Marshall is best know as Laverne on Laverne & Shirley. For baseball fans, she's also the director of A League of Their Own. Marshall also directed Big, which starred Tom Hanks. 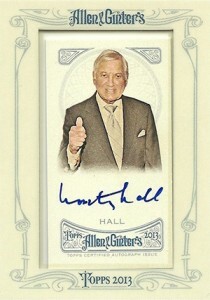 In recent months, Marshall has also had autographs in 2012 Leaf Legends of Sport and 2013 Panini Golden Age. If you've glanced at the covers of bodybuilding magazines, you're likely familiar with Phil Heath's body of work. He's a two-time Mr. Olympia, winning the prestigious bodybuilding competition in 2011 and 2012. Robin van Persie is one of the greatest scoring threats in soccer today. He's won the Golden Boot as the Premier League's top scorer each of the last two seasons while playing for Manchester United, the highest profile professional team in all of sport. Robin van Persie has also been a standout with Arsenal and is the captain of the Dutch national team. Few boxers have won as many titles as Roy Jones Jr. Starting his career as a middleweight, he took several championships all the way up to heavyweight. 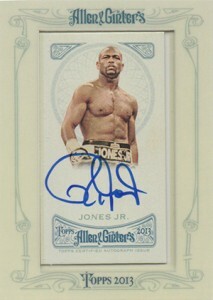 The Boxing Writers Association of America named Jones the Fighter of the Decade for the 1990s. 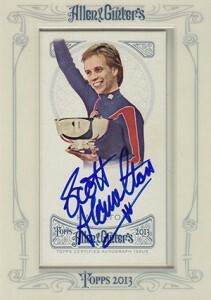 When it comes to figure skating, Scott Hamilton is considered an all-time great. Winner of four consecutive world championships between 1981 and 1984, he also won a gold medal at the 1984 Winter Olympics in Sarajevo. Following his amateur career, Hamilton turned pro, skating for the Ice Capades and co-founding what would become Stars on Ice. Following a strong career as a professional lacrosse player that included a pair of Major League Lacrosse Championships, Shawn Nadelen has transitioned into coaching. He is currently the head men's coach at Towson University. 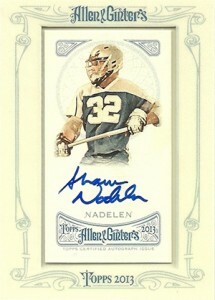 As a player, Nadelen also helped Team USA win gold at the 2010 Federation of International Lacrosse World Championships. Depending on who you talk to, Tommy Lee is best known as either the drummer for Motley Crue or for his wild exploits as Pamela Anderson's husband. This isn't Lee's first autograph card. 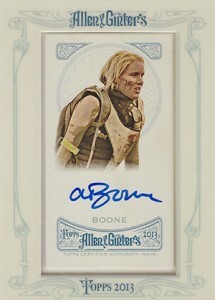 Like Rose, he appeared in 2013 Topps Archives Heavy Metal Autographs. He has also appeared in sets for Leaf. The oldest son of Bob Marley, Ziggy Marley helped keep music in the family. Ziggy Marley is a Grammy-winning musician who is also known for being politically active. 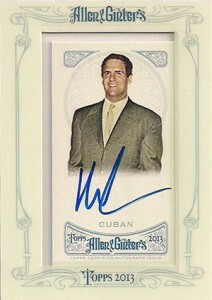 2013 Allen and Ginter. Chanel Iman auto. (Model, Actress). 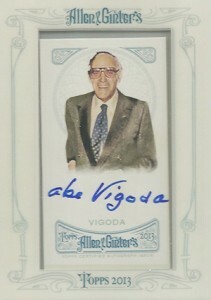 Wish they had Faustino, Applegate, and Sagal as well in the autograph list. Maybe Bearse, McGinley, and Garrison would work as well. Tom � All the Married family (and Bearse) have signed in the past. Sagal is actually in the Pop Century set releasing this week. Donruss Americana is another place to look. If I remember correctly, one Americana set has a quad with all four. 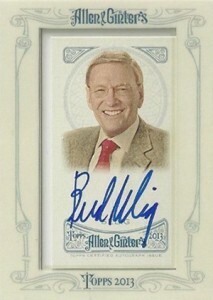 One change needed for the Bud Selig profile. He is the former owner of the Milwaukee Brewers. When he became commissioner, he gave control of team to his daughter, which was a disaster. Mark Attanasio purchased the team in 2005, which coincides with the team’s rise to relevancy again. Selig did bring major league baseball back to Milwaukee, which fans are grateful for. However, not to speak for all Milwaukee fans, but his time as owner is looked upon as poor at best.